Corn is one of the most versatile vegetables grown in America. Now, as Modern Farmer reports, researchers have found a way to make it even more useful, by growing corn that yields 50 percent more kernels than the average crop. In their study, published this week in the journal Nature Genetics, the researchers explained how they used an existing genetic mutation to cultivate their kernel-packed cobs. 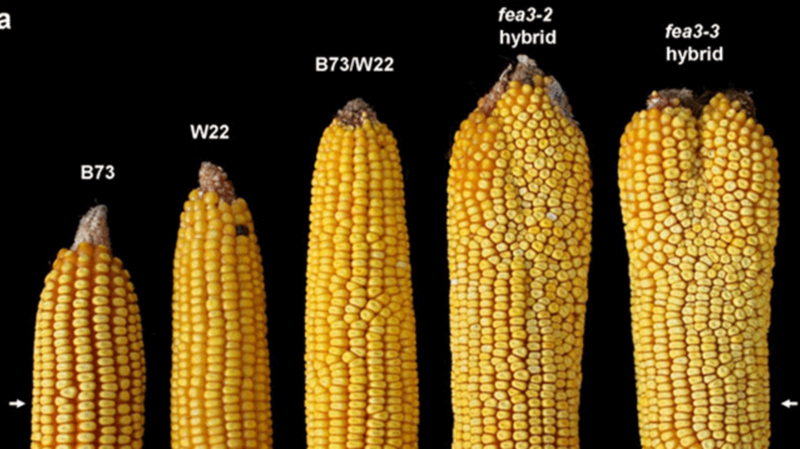 They first discovered that corn lacking the FEA3 gene grew into smaller plants with haphazard rows of kernels. Because the FEA3 gene dictates stem cell production, without it the kernels were able to grow uninhibited. They grew so quickly that they stunted the ear's growth early on. This may not sound like a desirable mutation to have in your plant, but the scientists suspected they could tweak it to keep the hyperactive kernel growth without killing the corn. They turned out to be correct: By weakening the alleles, or variants, of the gene, they were able to produce a corn hybrid that bore 50 percent more kernels than the control crop. It's a discovery that could have a huge impact on the corn industry, which accounts for more than 90 million acres of farmland in the United States. But the researchers point out that the new type of corn may not produce the same yield in a farm setting as it does in the lab. Even if it is suited for commercial farming, it would take years before it's ready to hit the market.